German physician; born in Jauer, Prussian Silesia, Nov. 27, 1836. He studied medicine at the universities of Breslau and Berlin, graduating from the last-named in 1859. In this year he was appointed physician at the Allerheiligen Hospital, Breslau; in 1868, chief physician at the municipal poorhouse; in 1869, privatdocent;in 1874, professor in Göttingen University (which chair he still  holds); and in 1877, director of the university hospital and dispensary. Ebstein's specialties are malassimilation and defective nutrition, in the treatment of which he has introduced several new methods. 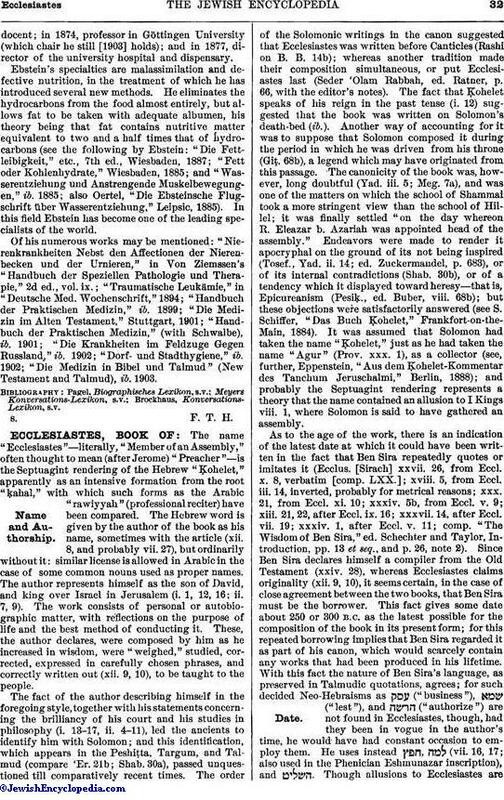 He eliminates the hydrocarbons from the food almost entirely, but allows fat to be taken with adequate albumen, his theory being that fat contains nutritive matter equivalent to two and a half times that of hydrocarbons (see the following by Ebstein: "Die Fettleibigkeit," etc., 7th ed., Wiesbaden, 1887; "Fett oder Kohlenhydrate," Wiesbaden, 1885; and "Wasserentziehung und Anstrengende Muskelbewegungen," ib. 1885; also Oertel, "Die Ebsteinsche Flugschrift über Wasserentziehung," Leipsic, 1885). In this field Ebstein has become one of the leading specialists of the world. Of his numerous works may be mentioned: "Nierenkrankheiten Nebst den Affectionen der Nierenbecken und der Urnieren," in Von Ziemssen's "Handbuch der Speziellen Pathologie und Therapie," 2d ed., vol. ix. ; "Traumatische Leukämie," in "Deutsche Med. Wochenschrift," 1894; "Handbuch der Praktischen Medizin," ib. 1899; "Die Medizin im Alten Testament," Stuttgart, 1901; "Handbuch der Praktischen Medizin," (with Schwalbe), ib. 1901; "Die Krankheiten im Feldzuge Gegen Russland," ib. 1902; "Dorf- und Stadthygiene," ib. 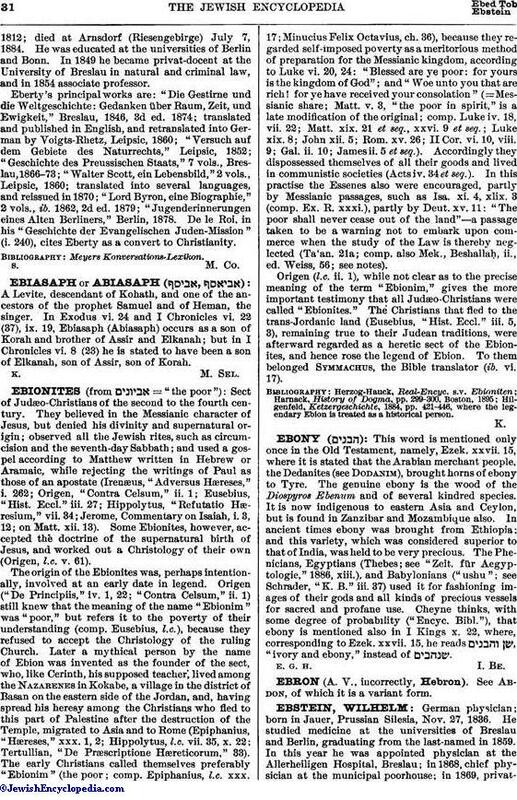 1902; "Die Medizin in Bibel und Talmud" (New Testament and Talmud), ib. 1903.